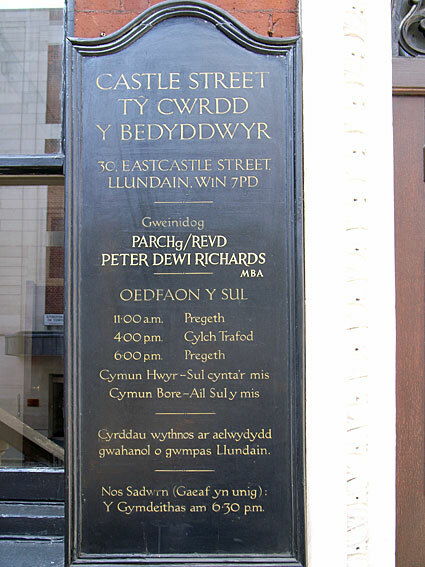 Capel Bedyddwyr Cymreig, Ty Cwrdd, 30 Eastcastle Street, London W1N 7PD - Welsh chapel in London. After the accession of Henry Tudor to the throne, increasing amounts of Welsh men and women headed for London, but with many being employed in seasonal work, most didn't take up permanent residence. The middle of the nineteenth century saw another surge towards London, dominated by dairymen and drapers, followed by a large influx of Welsh shopworkers, industrial workers and domestic servants during the Depression. 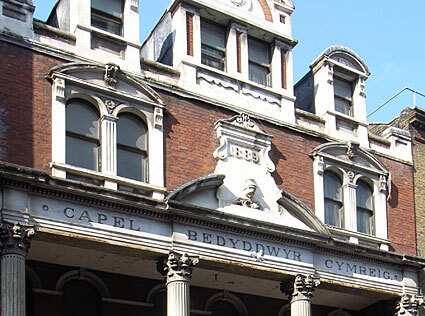 With London becoming home to the oldest and largest Welsh community outside Wales, emigrants set up their own churches and chapels. Most born and bred Londoners will tell you that there was at least one Welsh teacher at their school, reflecting the flow of Welsh teachers to London in the 1950 and 60s. Around 70,000 Welsh-born now live in London (including the editor of this site! ), and it has been estimated that there are 50,000 Welsh speakers in the Greater London area. 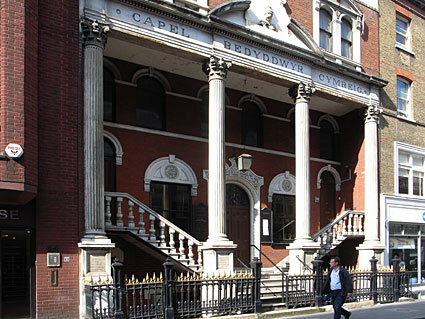 The impressive facade of Capel Bedyddwyr Cymreig, 30 Eastcastle Street, London W1N 7PD. List of forthcoming services in Welsh. 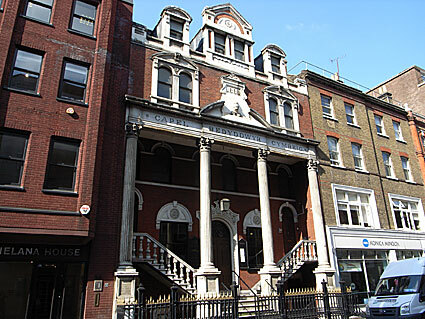 Eglwys Gymraeg Canol Llundain means, "Welsh Church in Central London." 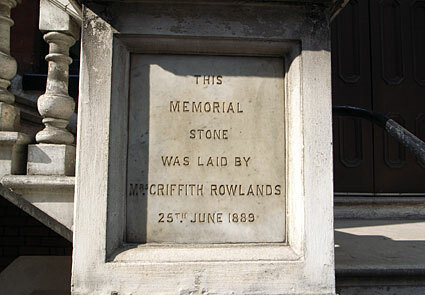 Memorial stone laid in 1889. In the same year, the Welsh Intermediate Education Act was passed and the Miners' Federation of Great Britain was founded in Newport, South Wales, arguing for the creation of a Board of Arbitration to replace the sliding scale and the restriction of the working day to eight hours. 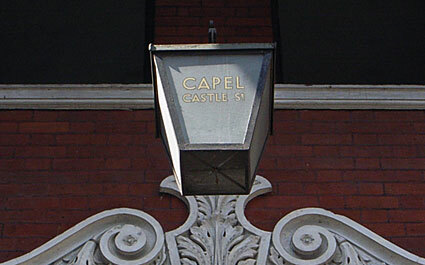 Attractive old gas lamp above the chapel's entrance ('Capel' means 'Chapel' in Welsh). 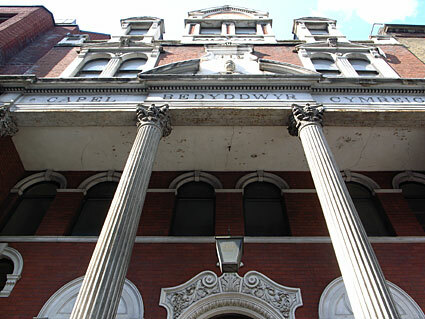 Another view of the facade. 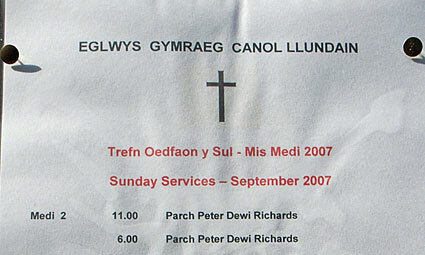 Note the address written in Welsh, with 'Llundain' for London. » Adam & Eve Ct.